Passages to the Past is pleased to bring you a guest post from David S. Brody, author of Cabal of the Westford Knight! Welcome David! While trying to help an elderly couple save their home, attorney Cameron Thorne is thrust into a bloody tug-of-war involving secret societies, treasure hunters and keepers of the secrets of the Jesus bloodline. Joined by Amanda, a beautiful British researcher with secrets of her own, Cam races around New England with only two choices, unravel the 600-year-old mysteries encoded in the ancient Templar artifacts or die trying. 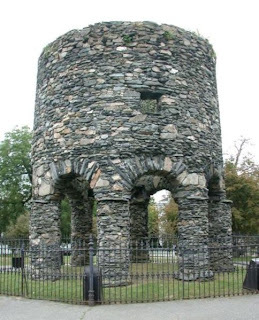 Rhode Island’s Newport Tower—a round stone tower built in medieval fashion—has long been thought to be a colonial windmill. But a mortar sample from an archeological dig was recently carbon-dated to the mid-1400s. 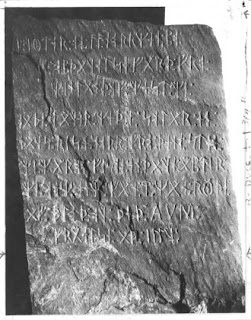 The Narragansett Rune Stone is a runic inscription engraved on a boulder in Rhode Island’s Narragansett Bay. 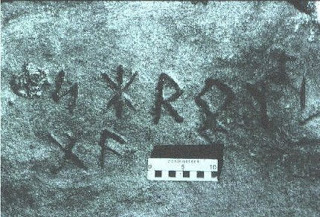 The inscription, visible only for 20 minutes a day at low tide, contains the same rare, medieval runic character as the Spirit Pond stones. The Westford Knight is a carving of a medieval battle sword pecked into a rock outcropping in Westford, Massachusetts. (Portions of the inscription depicting a medieval knight carrying a shield have largely faded.) This carving may have been left as a memorial to a fallen knight by a group of 14th-century Scottish explorers led by Prince Henry Sinclair. Details of this journey are recounted in a 16th-century chronicle known as the Zeno Narrative, written by the descendants of the original admiral of the Sinclair fleet. The authenticity of these artifacts was recently buttressed by research conducted on Minnesota’s Kensington Rune Stone, a tombstone-size slab dated 1362 and inscribed with medieval runic lettering similar to that found on the New England rune stones. A renowned geologist studying the weathering patterns of the minerals within the rock’s inscriptions determined the stone to be an authentic medieval artifact. So what do these artifacts tell us about the medieval explorers and why they were here? There is some evidence and much informed speculation indicating that Sinclair—clan chief of the prominent Knights Templar family made famous by Dan Brown as carrying the blood line of Jesus—led a band of outlawed religious warriors to the New World in the late 1300s to escape Church persecution and form an alternative, liberalized version of Christianity based on its “pagan,” nature-oriented roots. In fact, Sinclair’s grandson later built Scotland’s Roslyn Chapel, a monument to pagan imagery and iconography. The Monsignor crossed himself and bowed his head in a quick, silent prayer. He lifted his head and nodded, a nod that indicated agreement rather than merely understanding. “I need to be careful here — you and I, as attorney and priest, we are required to keep certain communications in strict confidence. So please excuse my oblique approach to this conversation.” He took a deep breath. “In the event you intend to continue to represent Mr. and Mrs. Gendron in this matter….” He paused and raised an eyebrow, offering Cam the opportunity to respond. “I don’t follow.” Perhaps because his head was still ringing like a church bell. “Well, if Mr. McLovick didn’t plant the bomb, then someone else did. Someone who saw the Bobcat and wants to keep both the Gendrons and Mr. McLovick from digging. Someone who probably knows for certain what is buried in the back yard. The Monsignor shrugged. If he knew, he wasn’t telling. Cam eyed the priest. Marcotte held his gaze without blinking, a steady, kind half-smile on his face. The words the bailiff used in the courtroom while swearing in witnesses popped into his head: “The truth, the whole truth and nothing but the truth.” He believed the priest was telling the truth and also probably nothing but the truth. But the whole truth, now that might be a different story. David S. Brody is a Boston Globe bestselling author named “Best Local Author” by the Boston Phoenix newspaper. He is a Director at Large of the New England Antiquities Research Association (NEARA). A real estate attorney, he resides in Westford, Massachusetts with his wife, novelist Kimberly Scott, and their two daughters. He coaches youth sports and Special Olympics and plays in adult hockey and softball leagues. This was a very interesting post on runes. Cabal of the Westford Knight looks like it would be a fun read. Thanks for hosting David today. I don't always read my clients books, but this one looks so fascinating that I am holding onto my copy. Wow, totally cool! The book sounds marvelous and the post was absolutely fascinating. This elegance beads are usually silver and also rhodium as well as rare metal plated having http://www.pandorabeadssell.co.uk/ as well as cup and also appear in no less than 800 styles [url=http://www.pandorabeadssell.co.uk/]Pandora Charms[/url] All these beads characterize the birthstones, zodiac signs, family pets, alphabets, albhabets, and each kind have Pandora Charmswith exclusive and also important layouts. These vast decision be sure that you don't have repetition of design. This beads were created so it complements current bracelet or maybe necklace. In case you choose to acquire necklace around your neck as an alternative to drops alone, the collection is often more individualized for you to appeal anyone heart and soul. That necklace around your neck starting is supplied in inches width plus the necklace duration is normally ins. This sizing's in addition to angles is often interchanged so that the option of toggle bracelet as well as a necklace around your neck as well as the keychain can be special for your requirements and it will takes age range to discover it is replicate on earth.